Russia deliberately destroys the historical and cultural treasures on the peninsula and attempts to replace them with monuments to tyrants or to the so-called “polite men” [Russia’s military forces used by Putin to conduct the special operation to occupy and annex the peninsula in the winter-spring of 2014 – Editor]. KIEV (QHA) – According to information from the Ministry of Culture of Ukraine, prior to the Russian occupation of Crimea, on the territory of the peninsula there were 6 large historical and cultural preserves, including the Tauric Chersonese National Preserve in Sevastopol, the Alupka State Palace-Park Museum-Preserve Complex, the Bakhchysarai State Historical and Cultural Preserve and others. 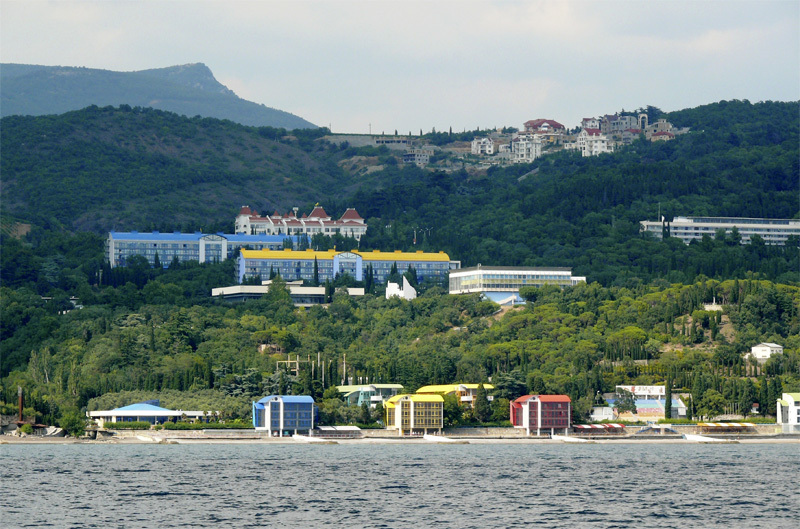 Also in the Crimea there were 54 museums, including 35 state and municipal ones in the Autonomous Republic of Crimea and 5 in Sevastopol, where more than 1.2 million main exposition items, about 400 thousand scientific and auxiliary items and more than 2 million archival materials (documents and audiovisual materials) were preserved. On August 8, 2014 – mere months after the annexation – the illegitimate State Council of Crimea adopted the “Law on the Sites of the Crimean Cultural Heritage,” which states that the Russian Federation was entitled to all museum artifacts and cultural monuments of the peninsula. After that, in January 2015, the Russian State Duma passed a law simplifying the procedure for including the Crimean cultural heritage in Russian museum registries. And on October 17, 2015, Russian Prime Minister Dmitry Medvedev signed an order that included more than 220 cultural and historical monuments of the Crimea in the list of Russian federal sites, including ancient cave settlements, remains of medieval fortresses, artifacts of the Khan’s Palace at Bakhchysarai and Tauric Chersonesos, churches, mosques, monuments of architecture and others. Despite these laws adopted by the Russian occupation authorities, the Crimean architectural monuments are being destroyed not just by the passage of time, but also by the hands of the so-called “Crimean authorities,” and the peninsula’s cultural treasures are constantly moved to Russia. Sadly, the biggest victim has been the ancient city of Tauric Chersonesos, a UNESCO’s cultural heritage site. When Crimea was occupied, the international organization flatly refused to recognize the Russian status of the Ukrainian site. Moreover, in 2016 UNESCO added Chersonesos to the list of places that are dangerous to visit on a par with the monuments of Syria and Afghanistan. Meanwhile, the occupation authorities replaced the leadership of the Tauric Chersonesos historical-archeological museum-preserve with Svetlana Melnikova, the former head of the Vladimir-Suzdal Museum-Preserve in Russia. The same fate befell the director of the Museum of Heroic Defense and Liberation of Sevastopol. It’s director Oleksandr Rudometov was forced to resign giving way to Colonel Nikolay Musiyenko, former deputy director of the Stalingrad Battle Museum in Russia. And how can the Russian Orthodox hierarchy resist involvement in Tauric Chersonesos? In November 2016, the diocese of the Russian Orthodox Church in occupied Simferopol quickly requested that Russia’s Federal Agency for the Management of State Property gave it the ownership of 24 sites of the Tauric Chersonese Museum-Preserve. The Russian director of the museum Svetlana Melnikova, in reaction to the church’s actions, if the state agency decides in the church’s favor, the museum complex would lose almost all of its property and be come inoperable. Moreover, the Tauric Chersonese Museum-Preserve’s status as a monument of world significance would be threatened if its premises are transferred to the Russian Orthodox Church. “The preserve is sliding from scientific research towards religiosity and breaking ties between Chersonesos and its international partners. The staff of the preserve is being cut down, about 10% have already been dismissed,” – said Valentyna Potapova, deputy head of the “Almenda” civic education center, who participated in the review. The Russian Federation has not only illegally appropriated all of the Crimean cultural monuments, but also has been moving collections from the Crimea to the St. Petersburg Hermitage Museum, including unique exhibits from the Tauric Chersonese National Preserve, Sudak, and the Central Museum of Tauria in Simferopol. “I want to emphasize that the commission by the Russian Federation of any actions in the temporarily occupied territory of Ukraine, directed, in particular, to change the jurisdiction over sites of cultural, industrial and technical heritage of Ukraine, is a direct violation of Ukraine’s sovereign rights, as well as universally recognized norms and principles of the international humanitarian rights,” – the head of the permanent delegation of the Verkhovna Rada of Ukraine in the Parliamentary Assembly of the Black Sea Economic Cooperation Lyudmyla Denisova noted. The Russian military also claimed a part of the unique historical site for itself, having decided to build a helicopter pad inside of the Tauric Chersonese National Preserve. The invader’s military do not care much about preserving the cultural monument and, without much consideration, they took and destroyed an ancient manor in the preserve territory. After Tauric Chersonesos, the invaders set their sights on the Khan’s Palace. Last summer the Russian-controlled scientific and methodological council of the State Committee for the Protection of Cultural Heritage decided to conduct “emergency work” at the palace at Bakhchysarai. The former residence of the Crimean khans had been a candidate for inclusion in the UNESCO World Heritage List prior to annexation. 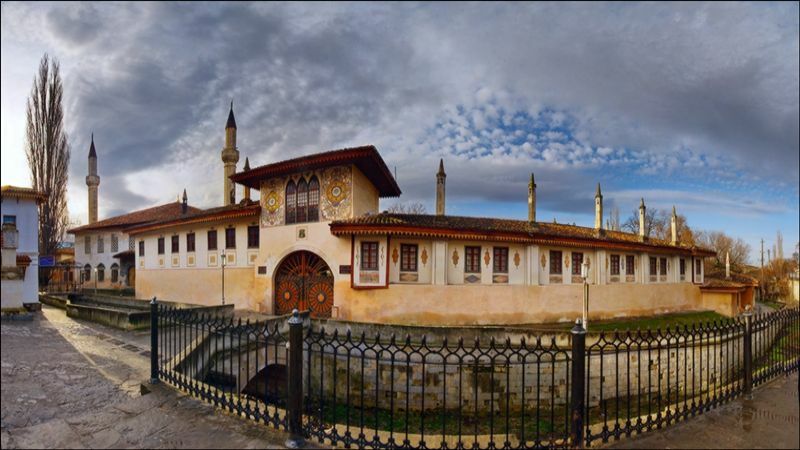 There are justified fears that the occupation authorities’ reconstruction efforts of the Crimean Khan residence will actually lead to the disappearance of this historical monument of world significance. “What do you think, what will happen if they [the Russian authorities of the Crimea — Ed.] 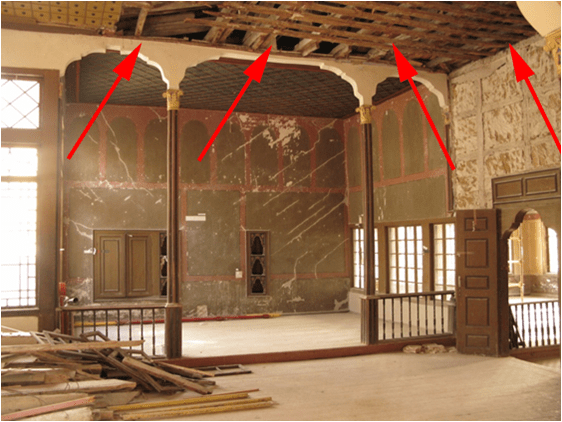 are allowed to conduct the restoration of the palace? At best, they will slap together something similar-looking from cheap modern materials, destroying all original and old cultural layers, murals, carvings, ornaments, etc., at worst – everything will be split apart into small pieces and end up in private collections, and in its place will remain a heap of construction debris,” – Zair Smedlyayev, the head of the Central Executive Committee of the Kurultai of the Crimean Tatar people, wrote. The restoration proposal for one of the structures of the complex — the Khan Mosque — includes its complete disassembly to the foundation. Smedlyayev suggests that during the disassembly certain details can be deliberately damaged or stolen for the purpose of selling on the black market. 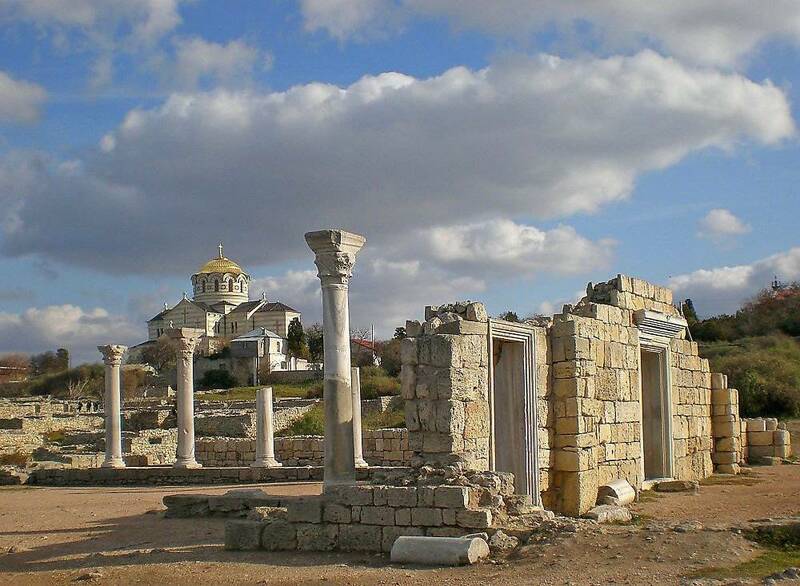 Ukraine’s Ministry of Culture received information that the occupation authorities and an unknown Crimean company had developed a construction project in the territory of the Bakhchysarai Historical and Cultural Preserve, the implementation of which should begin in the near future. Moreover, details of the project’s implementation is kept from the public. The construction organizations have neither special permits nor experience for historical restoration work. 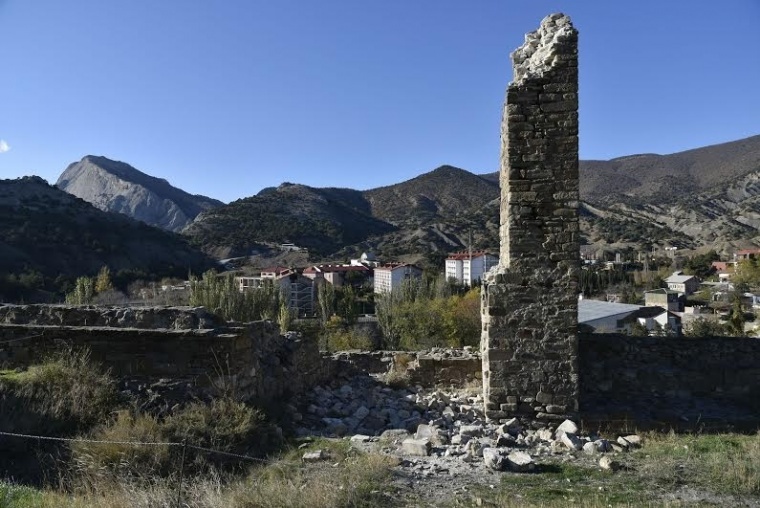 “The current critical state of all cultural sites, including the Khan’s Palace, is a direct result of the actions of the occupation authorities. The Ministry of Culture of Ukraine regards such actions of the occupation authorities as an enemy act aimed at destroying the cultural heritage of the Crimean Tatars. And as we know, today the Crimean Tatar people on the territory of the Crimea are experiencing an open repressive attitude on the part of the occupiers,” – the Deputy Minister of Culture Tamara Mazur emphasized. The project provides for the construction of a six-pillar metal canopy over the Khan’s Palace. One of the pillars, according to the latest information, will rest directly on the roof of the harem. To address that concern the designers of the restoration project have responded that they will simply move it slightly to the side. But such actions and changes are capable of completely destroying the cultural site. The top tourist destination, Lastochkino Gnezdo (Swallow’s Nest) castle is closed for 3 years. The official explanation is that this symbol of Crimea has been closed for reconstruction and repair works. According to the unofficial sources — the palace was closed due to the construction of elite villas in the neighborhood. “The site is unique, there is no such thing in the world. The foundation of it is a rock. First of all, you need to strengthen the cliff. There are many opinions. One of the options: injection. In the voids in the rock, a special material is pumped, which holds the rock together. 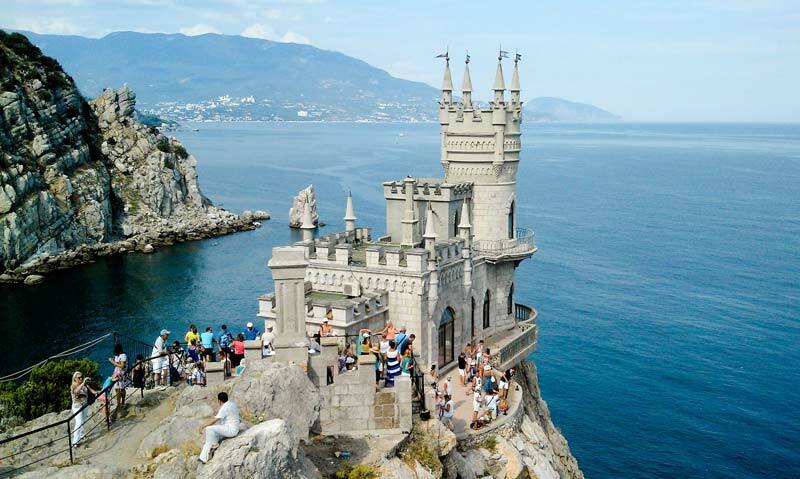 We are told that at the moment all this can be done,” – Swallow’s Nest Palace-Castle Deputy Director Alexander Levin says. In occupied Crimea, not only is the Swallow’s Nest collapsing, but also part of an ancient tower of the Genoese Fortress in Sudak has collapsed. The reason is these important sites are not properly maintained. Neither restoration work nor structural monitoring of the fortress facilities has been conducted. There are also reports that site’s new management is building hotel rooms and toilets in the territory of the ancient monument, and their negligence led to the site’s destruction. In addition to museums and cultural monuments, the Artek children resort has suffered under occupation. In order to expand the resort’s territory, its new Russian “management” pursued the demolition of several significant historical sites. The first building to fall to this fate was the old villa designed by Academician Beketov in 1903. The “management” of the camp did not take seriously the statements of local historians that this building is a monument of history and architecture. They argued that the building has no historical value, because it is not included in the official list of the cultural heritage of Crimea. The historians argue that this was an error as the Beketov villa was included in the official list of the historical sites of the Crimea prior to occupation. However, the problem is not only the villa, historians explain. Construction cannot safely occur in this area because of an ancient Muslim cemetery located next to it. There was a lot of free space around the villa. I think after its demolition, Artek would be able to build here a couple of new buildings. But near the villa is an ancient Muslim cemetery. There are maps that confirm this, – Ihor Baryshnikov, a public figure from Hurzuf [where Artek is located], said. Last year, the State Committee for the Protection of the Cultural Heritage of the Crimea planned to carry out restoration and repair works in the amount of 1.2 million rubles. In addition to the planned 20 sites, except Swallow’s Nest (132 million rubles), Livadia Palace (83 million rubles), the Khan’s Palace in Bakhchysarai (148 million rubles), it was decided to add to the list two more buildings in Evpatoria: the former kenassa building (1896) and the Ruschinsky Gymnasium building. In regard to the Khan’s Palace and the Swallow’s Nest, the experts of the department only gave recommendations on conducting further work. On October 21, 2015 Lyudmyla Denisova, the head of the permanent delegation of the Parliamentary Assembly of the Black Sea Economic Cooperation, said that exhibits from the Crimean museums such as Tauric Chersonesos, the museums of Sudak and the central museum of Tauris in Simferopol are being taken to the Russian Hermitage Museum in St. Petersburg. 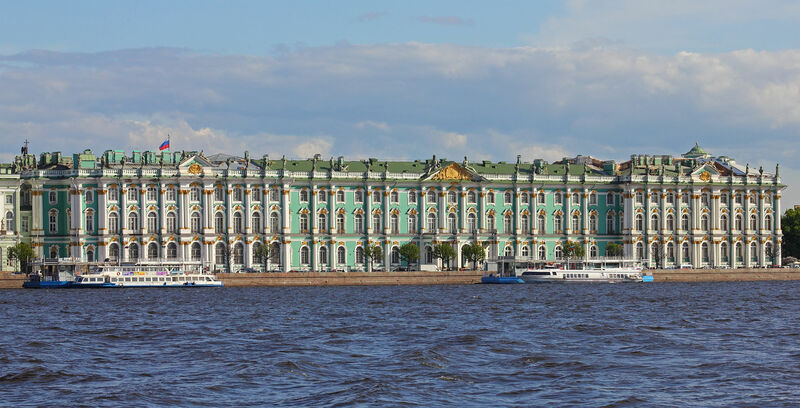 Although the press service of the Hermitage denied this information, from October 24, 2015 to January 24, 2016 the Hermitage held an exhibition titled “On the Ground of the Griffin. Ancient Archeology of the Hermitage in Crimea,” with items from the collection of the East Crimean Historical and Cultural Preserve in Kerch. In June 2016, the Tretyakov Gallery in Moscow opened an exhibition dedicated to the 200th anniversary of the birth of artist Ivan Aivazovsky, for which his paintings owned by Crimean museums were sent. Crimean “Minister” of Culture Arina Novoselskaya said that 38 paintings by Aivazovsky were taken to the exhibition in Moscow on July 11. Then the exhibition will be moved to continue in St. Petersburg. “We transfer the paintings to the famous museum – the Tretyakov Gallery, and not some private collection. There will be other valuable and rare exhibits, therefore the security of the exposition is provided at a high level. There is also a special procedure for transferring and receiving pictures. After the events, the experts of the Aivazovsky Gallery will check the correspondence of the originals,” – Tetyana Haiduk, the director of the Aivazovsky Museum in Feodosia (Crimea) pointed out. Meanwhile, on the mainland Ukraine, there are doubts that the Russian Federation will return the paintings of the famous artist. “Pictures Aivazovsky from the gallery in Feodosia is a part of the State Museum Fund of Ukraine. The Ministry of Culture, as the central body of the executive power, must authorize the physical movement of such objects. Accordingly, everything that is carried out without such permission is illegal,” – Vasyl Rozhko, the head of the department of museum business and cultural values of Ukraine’s Ministry of Culture said. 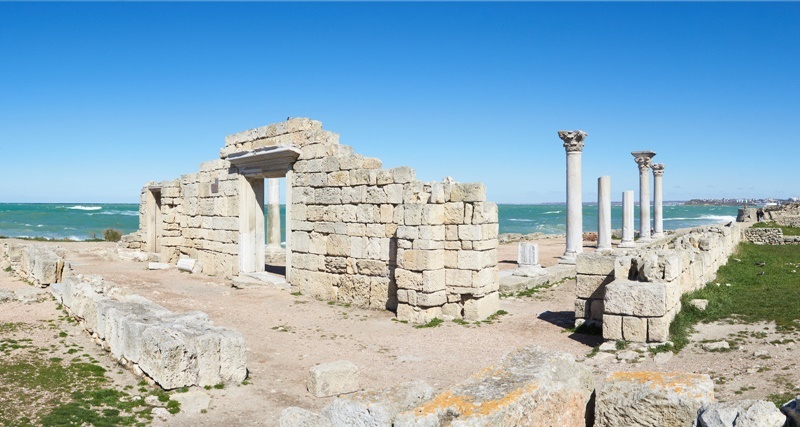 Ukraine’s Prosecutor’s Office of the Autonomous Republic of Crimea opened a criminal investigation into illegal seizure of control of Crimean cultural heritage sites by Russia. To support the investigation, in 2015 Ukraine began to create a register of cultural and historical treasures that were located in the temporarily occupied territories of Crimea and the Donbas. On the one hand, the occupiers destroy and export cultural and historical treasures from the peninsula, and on the other hand, Russia’s “Crimean authorities” fill the Crimea with monuments glorifying tyrants or “immortalizing” the illegal annexation. 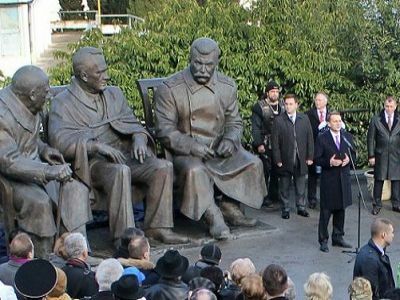 For example, in Livadia, a monument to the “Big Three” headed by Stalin was erected, while in Simferopol a monument was erected to the so-called “green or polite men” [Russia’s special forces that conducted the operation to occupy and annex the peninsula in 2014 – Editor]. Also in the city a monument was erected to Catherine II, which in 1783 for the first time annexed the Crimea. Thus, the Russian occupation authorities of the Crimea want to destroy or steal all true cultural treasures, while in their place monuments of dubious quality are erected to glorify “Russia’s greatness and power.” By these actions Russia attempts to delude the whole world that the Crimea “has always been Russian,” while “forgetting” that the peninsula was, is and will be the land of its indigenous people – the Crimean Tatars. Crimea’s many cultural treasures and artifacts testify to this. 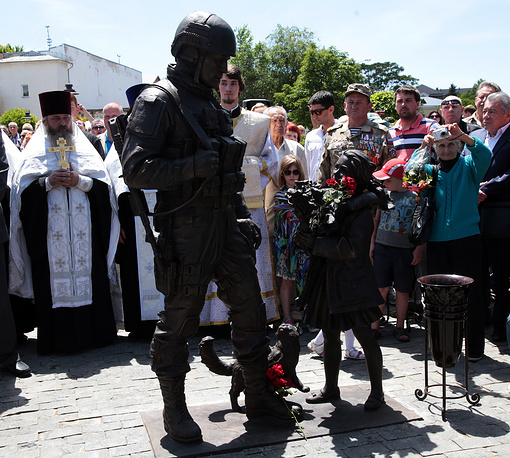 No matter how hard Russia tries to impose its new monuments onto Crimeans, the true cultural heritage can not be replaced. Who is Zeytullaev, the Crimean Tatar Russia just sentenced to 12 years without a crime?